Down the sidewalk past UVM rescue, there is a beaten up sign that reads: “Centennial Woods”. Following the dirt path brings you down a hill, to a pine stand. 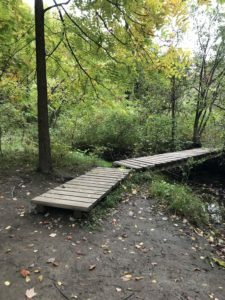 The path to the left of this pine stand is a path that takes you past a twisted tree and onto a wood plank boardwalk until you reach yet another tree stand. This time it is a birch stand. Past the birches take you down another 2 sets of boardwalks until you’re dropped off at Centennial Brook, my Phenology site. 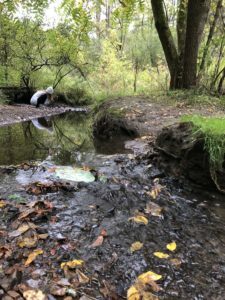 I chose this site after an Environmental Studies lab took us to focus on human impacts of the site, and I sat at the brook listening to it babble. The brook is small, thin enough that one big step would take you to the other side. One edge of the brook is rocky and muddy, dropping steadily into the water. The other side has clearly been eroded away, and is a miniature cliff of sediments and grasses. Shrubs extend out over the water, dropping leaves in to be carried away by the light current that ripples across rocks. The plants that surround the brook are made up of buckthorn shrubs, asters and allies, white baneberry, and a few large black walnut trees. *a note: All images and video posted are taken by and owned by the site publisher, Lucia Bolles (2018), unless otherwise stated.